Track 8 was recorded live at Henry’s Cellar Bar, Edinburgh 19 August 2016. The music of Captain Beefheart and The Magic Band remains a beacon of wild creativity for those with ears to listen. 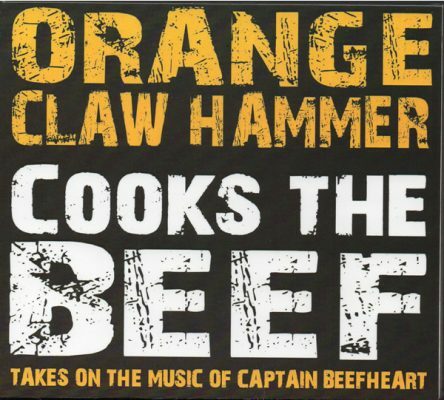 Orange Claw Hammer have approached this music with reverence, but also with a spirit of adventure and mischief. OCH are an Edinburgh based band fronted by sax player Steve Kettley. They have been performing their own particular takes on Don’s music for a few years now and have decided to release this specially recorded selection which draws on many of Beefheart’s albums. I particularly like to hear covers which give the original song a twist. OCH do just that. The integrity of the original is retained but it is used as a basis to develop what’s there. Steve Kettley’s playing is the dominant feature, replacing guitar parts or vocal lines. He is an accomplished player with a jazz background and is technically better than Don ever was although he can skronk some too! The band prefer to play instrumentals although there are a couple of exceptions on this album as you’ll see. The album kicks off with Hot Head which was a bit of a surprise as it showcases Steve Kettley’s vocals. I know he’s not confident about his singing but he does a fine job here by not trying to copy Don’s style. There’s a delightful take on Big Dummy. The spring-loaded rhythm propelling the mainly instrumental version whilst the use of one sung verse towards the end rounds the song off well. Click Clack starts with a slow swirling free form piece before kicking off into that great riff with slide guitar (from Stuart Allardyce) playing off against the sax rather than the harmonica of the Spotlight Kid original. It rattles along well even without the lyrics. There’s a more frenzied section towards the end before its final station stop. Ant Man Bee is another vocal track but with slightly distorted vocals this time which are mixed a bit low for some reason. I particularly like the guitar and drums (from Des Travis) on this track. A real foottapper. When I See A Mommy is led by Steve’s sax and is played slightly slower than the original giving it a bit of sinuous grace and smoky jazz night club feel. When It Blows Its Stacks gives bassist Dave Beards an opportunity to be heard as he propels the incessant beat of this heavy Beefheart rocker. Again sax and guitar have some fun and Steve steps in with some fine vocals too. The final track on the album is a live take from their August 2016 gig at their home stomping ground of Henry’s Cellar Bar. A straight performance of Flavor Bud Living followed by an instrumental Veteran’s Day Poppy shows that they can play this music live with precision and passion too. Overall a very enjoyable album, well played, doesn’t overstay its welcome and which makes you look at some familiar Beefheart songs in a slightly different way. The plays as it says on the sleeve “with a spirit of adventure and mischief”. A recommended album … and check out the band live if you get the chance! Had a front row seat at that gig. Great band, miss them at your peril. Southerners will have a chance to check ’em out at Festival Moo-ah in Corby and Preston the night before that. Got the CD in mailbox this morning. It’s absolutely excellent! Almost surprisingly excellent! Highly recommended also by yours truly, as if mr. Froy’s endorsement shouldn’t be sufficient.